There is no way that any project will have the expected outcomes unless goals and objectives have been set and agreed. Sure there will always be the accidental discovery or success, such as Post It Notes or penicillin, but if you want to ensure success then set goals and objectives. 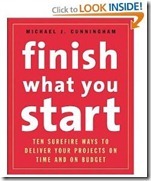 Imagine a project that does not have well defined goals and objectives? Does one come to mind? We have all been a part of such endeavors, sometimes they come out with moderate results, but more often than not they produce what was defined; a variable and flexible se t of outcomes and a surefire way to reduce your success. Individuals often shy from this first step, because it also means potential conflict, facilitation, negotiation, compromise, research and lots more. However, avoiding the issue entirely, or making up your own goals and objectives without the participation of others involved will surely affect the potential for results. Set your high level goals. First of all create a short list of items that will represent your high level goals. Example: These might be to increase sales or increase margins; improve sale productivity. Review with the team and create detailed objectives. Review these with the members of the team who would likely be able to affect these goals, or at the very least be responsible for delivering the improved results. Example: Set up a brainstorming meeting with an agenda to review ideas to increase sales productivity or margins. Invite those who can help. Use the outcomes of your goals and objectives to drive the project definition and milestones.